Five years ago, a harrowing flight spooked Peter Koh so badly that it forced him to confront his mortality and re-examine his life. He had by then devoted more than three decades to Pete's Creation, which he had built from a small T-shirt business into a sizeable marketing solutions company with offices in China, Germany and the United States. "All those years, it was all about setting key performance indicators and how much I wanted to make," he says. "There never was a time when I sat down and asked myself what was enough and what I wanted for myself." Like everyone else, he had a bucket list, but he never did anything about it. "I always told myself, 'There's always another day.' But what if that day never comes?" He then made the radical decision of selling Pete's Creation. The profits were tidy enough for him not to have to work again for the rest of his life. "I took it very easy and travelled all over the world with my wife. We went to Mongolia, North Korea, Estonia, Europe and the US," says Mr Koh, now 51. He adds jokingly: "I became a different type of CEO, chief entertainment officer for my wife." But the novelty soon wore off. "On some days, I would wake up, looking at my phone and wondering who would message me and invite me for lunch." By chance, a lawyer friend introduced him to the bosses of Oceanus Group, who entreated him to go and captain their wonky ship. Although it is the world's largest land-based abalone producer, the listed company was in the doghouse, plagued by years of losses and management woes. It took a bit of persuading, but Mr Koh agreed to go on board, first as an independent director, and then as its chief executive in December 2014. One of the main clinchers, he says, were the investors. "I went to a couple of the shareholders' meetings. Quite a few who invested in the company were old folk who had put in chunks of their savings. I told myself and my team that if we could turn the company around, we are indirectly also doing a good deed." Cutting a trendy figure in a crisp white shirt and faded jeans, Mr Koh is the youngest of six children. His late father used to run a small business selling shipping supplies; his late mother was a housewife. For the first 14 years of his life, he had it good, living in a spacious condo in the Newton area and given all he asked for. Upheaval came when his father's business failed. "To make matters worse, he suffered a stroke and was bed-ridden after that," Mr Koh says. The family moved from their posh condo to dingy rented quarters in the Lavender and Balestier areas. "I remember our family pretending not to be home when landlords banged on our doors to chase us for our rent," he says. "We moved so often that my classmates asked if moving was the family hobby." To help lighten the family burden, the former student of Balestier Hill Primary and Beatty Secondary gave tuition, worked part-time as a lifeguard and also became a freelance photographer. He wanted to study business at Ngee Ann Polytechnic but failed to get in, so he settled for electrical engineering at Singapore Polytechnic instead. "I had no interest in the course, but my friends said I could learn to love it, so I went along," he says, shaking his head. That did not happen. Instead, he floundered for two years before he summoned the courage to tell his mother he wished to quit. With a wry grin, Mr Koh says he is lucky he developed a sense of self- awareness early in life. "I knew I was not exceptionally smart, so I told myself that I would just have to work a lot harder to make it in life." The day after his ORD (operationally-ready date) after national service, he was already working as a storeman in a camera company. One day, he chanced upon a newspaper ad by a Fortune 500 company looking for graduates to become management trainees. "I called and arranged an interview without telling them I was not a graduate," he lets on. The interview was held in a factory in Sungei Kadut, an industrial estate near Kranji and Choa Chu Kang. He took a bus there, not knowing that the venue was quite a distance away from the bus stop. "I ended up being chased by dogs. I ran and by the time I reached the office, I was drenched in sweat," he recalls. His interviewers, he says, probably saw humour in the situation and offered him a job although he did not have a degree. Together with another hire, he was put through a gruelling nine- month training programme by the company, which dealt in industrial chemicals. "It was worse than BMT," he says, referring to basic military training. There were days when he made do with only a few hours of shut-eye. "My fellow trainee and I would literally fall asleep while peeing," he says with a laugh. "But I told myself that the company was only training grads and since they gave me this opportunity, I had to give it my best shot." His go-getting ways served him well. He doggedly pursued sales leads in his own time and scored a big break when he brought in a couple of new contracts. "The management did not expect that from a trainee. Even the big boss from the US called and congratulated me for my good work," he says. But recognition, he soon discovered, was a double-edged sword. His immediate boss saw him as a threat and inveigled to get him into trouble. "I was young and thought everything would be okay if I worked hard. But I realised the world was not so straightforward." He left the firm after 11/2 years, heartbroken and disillusioned. A short stint at a florist's followed before a phone call one day from a friend changed his life. The friend wanted his help to get a batch of T-shirts printed for a project. Since he was free, Mr Koh agreed. He enjoyed it so much that he decided to make it a business. "There was no capital involved, and I didn't have to worry about stepping on people's toes. I could work as hard or as easily as I wanted," he says. That was how he started Pete's Creation in 1988, with nothing more than a pager. He went to army camps and knocked on the doors of companies, offering to source T-shirts and other corporate gifts. "Sometimes, clients would tell me they wanted to visit me at my office. I would lie and say it was under renovation. I was worried they would get freaked out if they knew I didn't have one." Three years later, he finally set up his first office, in an attap house in the Yio Chu Kang area. By then, he realised that he needed to do more if he wanted the business to grow. Although most of the items he dealt in were made in China, Mr Koh, like many operators in the same trade, often got their supplies through Hong Kong companies. "Not many people dared to go into China then because it was just opening up. But I decided to do away with the many layers and went straight to the source. Going into China made a lot of difference. The costs were way cheaper and there was a lot more variety," he says. Another turning point came in the mid-1990s, when oil giant Shell gave him a huge order for gifts, including umbrellas, for a big promotion. "The size of the order scared the Chinese supplier. They did not know if I could pay. So I told them I would be their hostage and that I would stay in China until they received their payment," he says. That deal opened many doors. "I managed to get a lot of credit from other factories because news just spread. I couldn't get loans from banks, but credit from these factories allowed me to carry out transactions I might otherwise not have the resources for," says Mr Koh, whose clients soon included major banks and entities like the Hong Kong Tourism Commission. Business got so good that soon Mr Koh decided to set up his own factory in Chuanzhou, in Fujian province, with a partner in China in 1997. To justify the investment, Pete's Creation also branched out into original equipment manufacturing, producing merchandise for the likes of Fila and Giordano. It also went into licensing, working with bodies like Fifa (The Federation Internationale de Football Association) to produce merchandise. By the 2000s, Pete's Creation had set up other divisions - interactive, design and media - with offices not just in China, but in the US and Germany. The combined annual revenue exceeded $10 million. Life turned hectic; he traversed the globe for business opportunities. He was on a flight from Singapore to Hong Kong one day when the plane ran into turbulence both severe and terrifying. The plane had to be diverted to Taiwan, and when it landed safely, passengers cheered with both joy and relief. Glad to have survived the trauma, the Caucasian man seated next to him told him he was on his way to sign a big deal in Hong Kong. But as the plane rocked and dropped, all the latter could think about was how he ignored his wife once when she asked for a sachet of sugar, and how he did not make good on a promise to take his children to the zoo. He asked Mr Koh what went through his mind. "I told him my mind was blank; I did not know what to think." Introspection came later, but with an urgency which surprised him. "I realised that I existed for the business. Every day, I was just worried about what came next. Every day I wanted more: bigger house, bigger car. I realised I had been so caught up in wanting to do well, but what is 'doing well'?," he says. That was when he decided he needed to examine his priorities. He abandoned plans to list the company and sold it instead. "The wise thing to do would be to consolidate everything and get a better deal, but I couldn't wait. I decided to sell it to my partner so that I could get out instantly," says Mr Koh, who sold the company in 2010. For the next few years, family, health and peace of mind came first. The offer from Oceanus, he says, came at the right time. "I wanted something challenging and meaningful, and Oceanus offered both." The fact that he was moving into a new industry also fascinated him because he reckons he will be learning something new . His work has been cut out for him since he started helming the company, which has abalone farms along the coast of Fujian and Guangdong in China. "The first thing was to plug the holes in the ship, and organise commands and controls. The ship is now not in any immediate danger of sinking, but it is drifting because there is no engine. It is time we put in a small little engine to give it direction." He wasted no time in getting to know the business, not just from farmers, but from academics and researchers, and has started revamping Oceanus' entire business model. Instead of competing with sea farmers, as it once did, the company now works with them by supplying them with abalone spawns. It then buys full-grown abalone from them for redistribution. 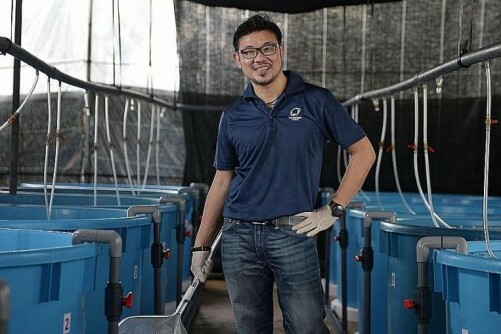 "This frees up cash flow, reduces the mortality rate of abalone, and I make more money," says Mr Koh, who is using the freed-up farm space to diversify into prawn and fish farming. His efforts have started to bear fruit. "Before I came on board, the company was burning through $13 million in expenses a year. Last year, I managed to cut it down to $5 million," he says, adding that he hopes he can nurse Oceanus back to health in another two to three years. Failure, he says, does not faze him. "Life is just a series of ups and downs. I believe everything happens for a reason. What we view as a problem today may bring fulfilment tomorrow."